Celebrating practical wisdom, mutual respect and the social nature of exchange. Trade School is a non-traditional learning space that runs on barter. Anyone can teach, and pupils sign up by agreeing to meet the barter requests of teachers. In this case, barter does not mean haggling, or bargaining. It simply means the social exchange that takes place when you offer someone an object, some advice, or a new skill in exchange for their knowledge. Trade School was founded 3 years ago in New York by Our Goods – a collective of creatives who wanted a way to more effectively share their skills and resources, and reduce a reliance on money or outside funding to run their projects. Using a strong idea, some core principles, an attitude of generosity and trust with the project, and a well-designed replicable website, Trade School has grown from the initial founding group to be a global coop with over 35 Trade Schools in nearly as many countries. We co-founded Trade School London nearly a year ago – and are continuing the ethos and aims of the global coop by sharing our experience so far and helping others set up. Why might an enterprising library be interested in hosting and nurturing a Trade School? It offers a tangible way to surface and engage skills, talents, resources locally. There is currently a lot of interest in ‘asset mapping’ or ‘asset based approaches’ and Trade School offers a way not just to list and map, but to engage and connect. The social exchange mechanism (barter) creates new richer connections and networks around learning. Because the exchange is non-monetary, the experience has a different quality, that is more personal and lasting. It lowers barriers around teaching and learning through creating an informal social setting and novel learning experience, and through the barter mechanism allowing for non-monetary involvement. This exchange also flattens hierarchies between the teacher and learners – who are all a group of people with value to bring to the class in different ways. We have seen that people who join a class to learn, often gain confidence and come back to teach themselves in a later season. 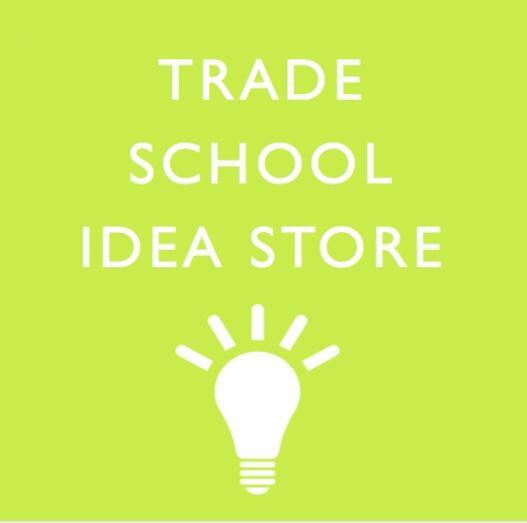 Trade School offers an opportunity to move from service delivery to co-production as it is not something that can be delivered, but something that only works if there is a group of co-founders, and lots of different people bring their knowledge and barter items. Trade School starts with the premise that anyone can teach. We all know something that is of value to others, perhaps we just have not thought of our abilities in this way before. To test this out, we imagined we were starting a new Trade School – named after the Whitechapel Idea Store in which the Enterprising Libraries event was being held. We asked everyone to think about what they could teach, and what they might be want in exchange. The results were the unique and inspiring list of classes you can see below. From our experience, you can ask any group of people and be constantly amazed both at the variety and depth of their collective knowledge, and at Trade School’s ability to offer a cler and enjoyable way to share more of it.